YouCanMakeThis.com is an amazing source for crafters of all natures! They have crafts anyone can make and the directions are very well-written and easy-to-follow. A beginner will feel right at home and an experienced crafter will really love the creativity and variety of the crafts:) We are super excited to get to shine the light on YouCanMakeThis.com once again! "Win a Craft Night for YOU and 10 of Your Friends"
Kim & Kris from "The DIY Dish" want to have a craft night with you and your friends! You get to invite 10 of your friends and EACH ONE OF YOU will win the Epic 6 Cutting & Embossing Tool and Letterpress Combo (each is a $169 value!) as well as accessories, di-cuts, papers, paints, etc. all thanks to Lifestyle Crafts. Catered food and a whole lot of FUN will all be a part of that craft night! All the details on how to enter are found on this 2 minute video as well as at http://www.thediydish.com/. Entries will be accepted until February 27, 2011. "Start (or add to!) your collection of unique and gorgeous fabric flowers! Kim and Kris from" The DIY Dish Show" will demonstrate how to make these beautiful flowers with some fabric and a glue gun! That's right - no machine sewing or hand-sewing involved! These flowers are perfect additions to handbags, shoes, tops, jackets, headbands, hair accessories, necklaces, and more. They cost pennies to make and are so easy to put together. These make beautiful gifis to give or to even make and sell! 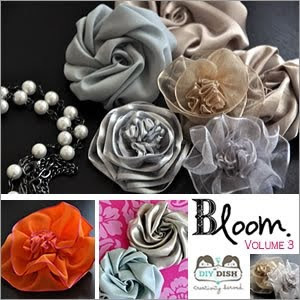 Add to your "bouquet" of gorgeous fabric flowers! Kim and Kris from" The DIY Dish Show" will demonstrate how to make these beautiful flowers with fabric, needle, and thread. 17 step-by-step photos for "flower #5"14 step-by-step photos for "flower #6"10 pages"
Buy It: Find these and other super creative handmade craft ideas at YouCanMakeThis.com!! Use the coupon code "YouCanMakeThis" and receive 15% off your order from 2/10/11 - 2/28/11! 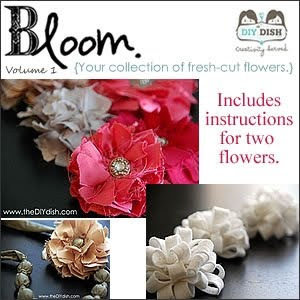 Win It: YouCanMakeThis.com has generously offered 2 ABCD Diaries readers 2 Volumes of "Bloom" books! To enter, folow this blog via GFC and tell us something that catches your eye at YouCanMakeThis.com! Disclosure: ABCD Diaries will be given 2 volumes of Bloom for posting about YouCanMakeThis.com. We were in no other way compensated. The opinions expressed in this post are ours and ours alone. The information was provided by the sponsor. I like their fabric storage containers! I'm a GFC follower! I follow via GFC! I like the boys Knit Lounger Shorts! I subscribe via google reader(kopperkirlz at gmail)! The Design Your Own monogrammed pillow caught my eye. I'm a GFC follower as ArtsyChaos. The Adorn - Volume 1: Decorative Garland and Fabric Bunting for Your Home (Alphabet Included)looks fun!! I like ABCD Diaries on facebook as Wendy R.
I like http://www.YouCanMakeThis.com on facebook as Wendy R.
Following @YouCanMakeThis on twitter as @ArtsyChaos. I follow @ABCDDiariesMom on twitter as @ArtsyChaos. entered 3 Yummy Mixes from Cook-In-The-Kitchen! entered Box of Cajun Goodies from Mossy Bayou Foods! entered HUGE Basket of Goodies for Mom & Baby!! entered European Market Bag and Produce Bags from Steward Bags! entered Gift Certificate to SnuggyBaby! I follow via GFC! I love the Fit to Be Tied Tutu! So cute! I entered your jar of diaper balm from Pyur giveaway! I follow. I love the Apple Cozy. The French Cuff Tote caught my eye. I follow via gfc and i like RUSKY THE PUPPY - CROCHET! I would love to make this: The Li'l Sally Doll Dress Pattern! for my daughter, she just adores dolls! i am a follower and i like the Bundle Pack:Daisy Bell and Daddy's Girl! I follow on GFC. I like the scrappy pants and top. I like the Sew Simple Felt Food: Time for Breakfast!